So what was the story in 2009? How did it unfold? Now we bring you the account of the Ninth day of this sublime divine odyssey. The Day Nine of Swami’s Divine Kodai sojourn in April-May 2009 began like most days in that season; it was another glorious day and it must be mentioned that in 2009 the weather gods were most cooperative in giving devotees wonderful climate almost right through, with very little of rain, except maybe for short spells. By Day Nine it was becoming quite clear that Swami would not stay much longer, and would definitely be back in Puttaparthi for Easwaramma day, as He did in 2008. Just to recall, that year after keeping everyone guessing for a long time, Swami went to Brindavan towards the end of April for what everyone thought would be one full month at least. But barely within five days or so, Swami returned because He wanted to be present in Puttaparthi for Easwaramma Day, which He had not done for a rather long time. 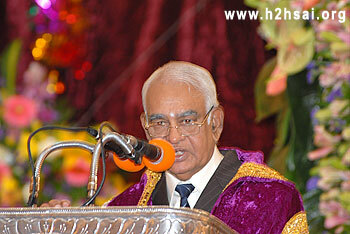 In 2009 too He made it clear that on Easwaramma day, that is May 6, He would be in Puttaparthi. Considering that Swami had celebrated many a Easwaramma Day in Kodai in earlier years, the Tamil Nadu devotees tried their best to keep Him back but finally, seeing that Swami’s mind was made up, they gave in. However, they decided they would nevertheless spend a day in that same kind of atmosphere, that is to say by having a grand Narayana Seva, and day nine was the day when that Seva was to be. Thus, background preparations commenced a couple of days ahead in anticipation. From Swami’ side, the teachers who had accompanied with Swami to Kodai on many occasions like Mr. Ruchir Desai and Mr. Gopinath, and of course all the students, were in full readiness to play their role. 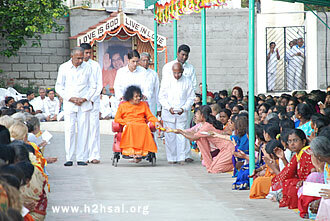 Narayana Seva has always been a feature of Swami’s seva. However, the way it is done tends to vary with the place, naturally, because there is always a local flavour. For the record, let us state that Narayana Seva is the term reserved for what in other circles would be called poor feeding. Right from the time such a service was first performed, which must have been way back in the forties perhaps, Swami used the term Narayana Seva to drive home the point that the so-called poor are in fact God in the disguise of a poor person, and that service to the poor is verily service to God. Carrying it one step further, the organisers started referring to those who would be fed as narayanas. They would thus say, for example, “Today, we expect five thousand narayanas,” and things like that. 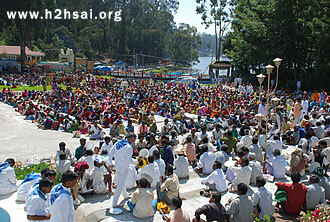 One thing about this seva in Kodai is that in recent years, the entire devotee crowd has come to be treated as narayanas. The really poor who start gathering from early morning, receive, besides food, some clothing too, and, equally important, blankets, which of course makes a lot of sense in a place like Kodai. At this point, maybe we should say something about how the Narayana Seva routine is gone through in Kodai. The bulk of the preplanning is done by Swami’s students, that is to say, they get ready well in advance and arrange the paper plates on which food would be distributed, the clothes and the blankets to be given away, and so on. Now that there is a canteen, food preparation for the narayanas is much easier to organise. Also water distribution is of late done using not tumblers and jugs as earlier but using small ready-made water satchels. Paper napkins for various emergencies, etc., are also kept in readiness. In recent years, the opportunity has also been used to give away goodies such as pencil sets, notebooks, school bags, etc., to children of the Bal Vikas who hail from neighbouring districts. On such a day, cooking starts very early when most people are still fast asleep. For the boys, work starts typically around say 6.30 a.m. so, when they begin laying out paper plates in long parallel rows on the floor of the Bhajan Hall, drawing from a huge stock of such plates piled up in the corner. Shortly thereafter, the food to be distributed is brought in big vessels and lined up near the far end of the room. Almost invariably, the prasadam is fried tamarind rice (South Indian style) and Sakkara Pongal which is like a sweet pudding - both of which, by the way, form the standard prasadam after Sivarathri and Akhand Bhajan sessions in Prasanthi Nilayam. Small buckets and big spoons to help with the distribution process are also kept ready. Sometime later, whenever Swami comes to the Bhajan Hall and inspects what has been done, small quantities of the two types of food are then taken in buckets and offered to Swami, who then blesses. Benedictions taken, an army of boys now swing into action and move around filling the plates already laid out. A little later when all is set, Swami gives the signal. Action begins immediately, with the boys forming with lightning speed, a long line that stretches out all the way from the Bhajan Hall out to the veranda, and from there down to the darshan area. The snake-like line stretches out all the way to the farthest point where most of the narayanas are gathered. 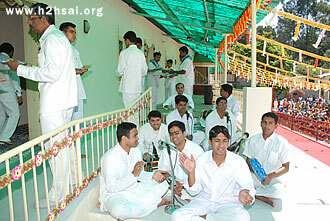 Simultaneously, the boys who are to sing bhajans take their places in the upper veranda, and when Swami gives the nod, the singing starts while the bucket brigade also goes into operation, that is to say, the already filled paper plates are passed from one person to the next down the line. It is quite a sight to see the prasadam being passed on from one volunteer to the next, all the way from the Bhajan Hall to the farthest end. 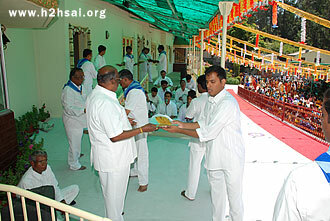 Understandably, students form a significant portion of the service line, but several senior devotees, especially from Swami’s party also join in. On the ladies side, it is strictly the volunteers of the Mahila wing of the Sevadal. As the pace of service picks up and the filled up plates in the Bhajan Hall disappear, fresh paper plates are laid out and filled. In the beginning, the speed at which the bucket brigade operates is slow, but soon the volunteers become charged, whereupon the rate at which paper plates have to be filled also starts increasing. It is at that stage, the volunteers doing duty in the Bhajan Hall start rotating fast, for bending down and continuously serving can be really back breaking! About say half an hour after start, Swami comes out, and moves down the normal darshan area, where ladies and children are busy eating, even as volunteers, are immersed in active distribution. Meanwhile, the service of water satchels also commences, while others get busy with distributing goodies to the Bal Vikas children. Needless to say it is the poor who get the preference but soon the gents and the ladies who form a part of the devotee crowd also get food served. 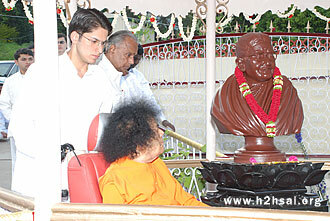 By this time, Swami is slowly approaches the place where the very poor are seated. As He comes near to them, Sevadals are ready with sarees for women, dhotis for men and blankets for all, which Swami distributes quite patiently, and with much love. This is the general routine, and 2009 was no exception. However, there was one important addition to the regular routine which was, that year a statue of Mother Easwaramma was also installed and duly blessed by Swami. 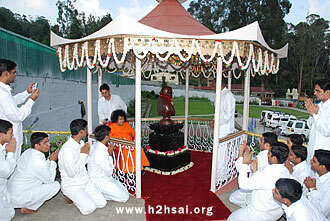 By the way, the statue was installed not in Sai Sruthi proper, but in the adjacent plot which was recently acquired to expand the Ashram area. 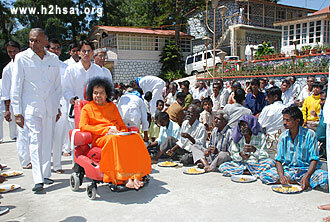 After distributing clothes and blankets, Swami then returned, and spent some time sitting in the balcony, watching the entire proceedings. And when the service seemed to have been completed, which was roughly one hour after start, He took aarathi and retired. 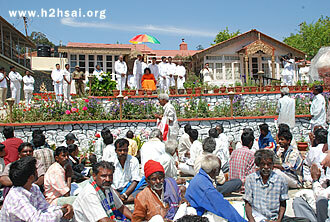 So that is how the morning session went off on Day Nine, Narayana Seva being the event of the day. Before we report on the evening session, it is important to recall a moving incident that happened during Narayana Seva in Kodai many years ago. The best way of doing that is to play an audio clip from a speech that Prof. Venkataraman delivered during the Convocation of the Sri Sathya Sai University in 2008, when Bhagavan blessed Professor to be the Guest of Honour. Here is the extract. “During such ( Kodai) trips, Easwaramma Day, which is observed on 6th May, would almost invariably occur while Swami was in Kodai. Needless to say Easwaramma Day was always celebrated in a most fitting manner, the highpoint of the morning function being an elaborate Narayana Seva during which food, clothes and blankets were distributed to the thousands who came to Sai Sruthi, Swami’s residence in Kodai. “Normally, after the function is over, Swami is in a very blissful mood but one year, He seemed rather pensive and withdrawn. Everyone was wondering why but no answers were forthcoming. Meanwhile, Swami whispered some instructions, whereupon His car was got ready. 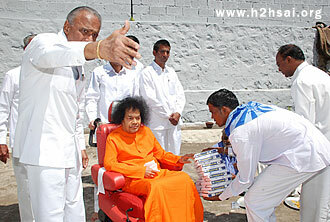 Swami simply got into His car and drove off, accompanied by a van that followed Him behind. Most people thought Swami was going for a short drive, which He sometimes did; that morning, however, it was different. 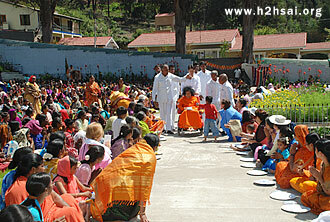 What was different became evident only when Swami returned after an hour and a half, beaming and full of broad smiles. Everyone was both relieved and happy. In the evening, there was the regular bhajan session of course, but with the addition of one unexpected item, which was an expression of public appreciation for the Burra Katha boys. As you know, boys call Swami Mother with good reason. Not only does Swami care for His students like a loving mother does, but He also does not miss an opportunity to show case their talents and feel proud like any mother would. Thus in that evening He decided to reward them in public. So that is how Day Nine was most memorable for everyone in Kodai. In the next article of this series, we will offer you the account of Day Ten.